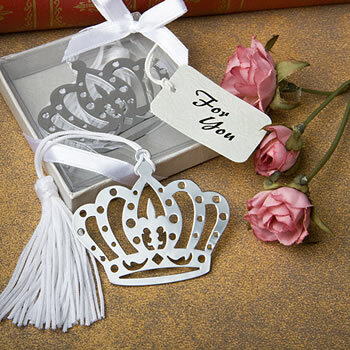 Whether you're celebrating a Sweet Sixteen, wedding, shower or other special occasion, these crown design favors are bound to fill the room with castle-worthy appeal. Sold only by Fashioncraft, each favor measures 1.875" x 1.75" (6" in length including tassel) and has a cutout shiny silver metal crown charm with a central fleur di lis design and an attached white satin tassel attached at its top for marking your last-read page. Also great as French themed favors or fairy tale favors, each crown bookmark comes packaged in a clear topped box with a silver base with an embossed rose design, wrapped with a white satin ribbon and an attached white "For You" tag with a subtle rose design. I ordered these for a woman’s retreat and was very pleased with my purchase. They’re pretty and about what I expected. They came very quickly with no problems! I would definitely recommend these and I would order from this website again. The bookmark favors are very nice and useful. The price is excellent and they are already packaged to give away! These were perfect as gifts for my book launch as thank you gifts. Cute and dainty.I was pleased. I bought these favors to give out at a formal event. Was pleasantly surprised with the quality of the bookmarks for the price that we paid. They have some weight, and are quite nice. They are nicely packaged, and shipped without damage. Buy with confidence. My first time ordering and everything was perfect. The items were just as described and very sweet. They went over well with guests at my daughter's fairy tale themed bridal shower. It was an added bonus that they came individually boxed with a bow. Shipping was efficient as well. Very pleased with the purchase of these markers. They were used for our lady's day guest at our church. We got a lot of positive comments . Good quality, easy item to share, people like it. We needed 70 gifts for pageants sisters and these were perfect!! Good quality, highly recommend. I couldn't have been happier with the quality of these crown bookmarks. They were well packaged, arrived in a timely manner and exactly what my committee was looking for. I'm so in love with my new crowns. I love how they came in a small box it was just so perfect. Thank you so much for making such awesome Crowns. I'm really happy and will be buying more soon. Received product as ordered. Excellent experience. Would definitely use this company again. Bookmarks were perfect for the event.